﻿﻿﻿ (Can’t see the video? Click here). 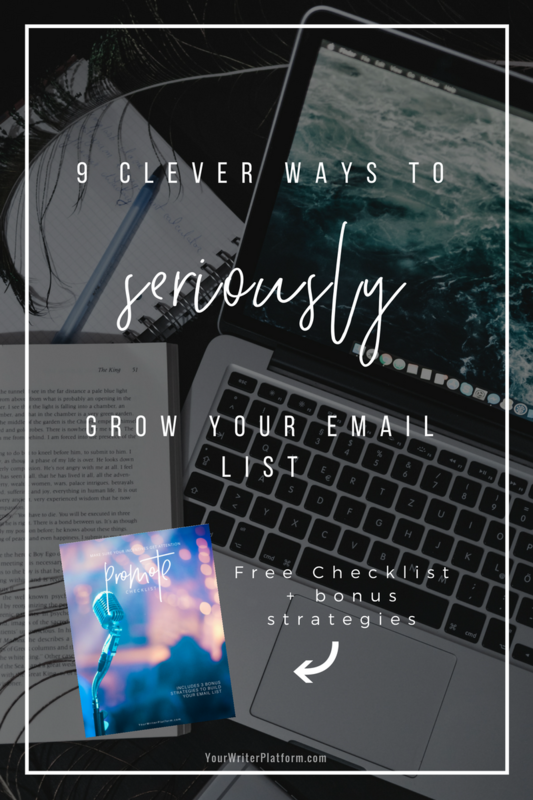 FEATURED DOWNLOAD: Grab the free PROMOTE checklist that shows you exactly how to get your opt-in incentive noticed, plus 3 bonus strategies for building your email list not mentioned in this post. After you’ve had time to see how a tactic performs, you can keep what works and stop wasting time on what doesn’t. If you know of other writers struggling to build their list, please do them a favour and pass this post along. Also, let me know in the comments below, which of these list boosting strategies you are going to implement first. Thank you, Kimberley, for your presentation on The Women’s Publishing Summit, and for providing a guide to building your platform. I look forward to reading them and implementing your advice. This is great – and your blog is so pretty and welldesigned… I’m jealous. I’m going to start focusing on Pinterest this year and your images are inspiring. Thanks Derek! That means a lot coming from you. Pinterest has always been one of my number one traffic sources, but I’m going to be upping my game with resources like Tailwind and Boardbooster. Thank you for the amazing advice!